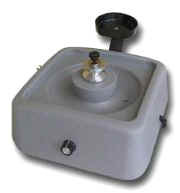 SMART CUT™ LP is a Variable Speed Precision Polishing, Grinding, Lapping Machine. Designed for Mechanical Sample Preparation. SMART CUT™ LP Provides equal Precision, Productivity and Versatility as High Cost Fully Automatic Grinding/Polishing Machines, at a small fraction of the price. 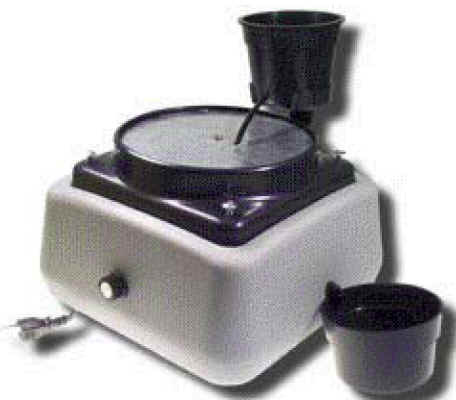 Compare to Brand Name Grinding / Polishing Machines for Sample Preparation & Materials Research. Perfect for Manufacturing and R & D facilities on a Budget. Its Variable Speed allows the operator the flexibility to move from high speed rough grinding to low speed final polishing. It's molded plastic housing will never rust. Capable of of withstanding more exploitation, requires less maintenance, and much easier to use that Fully Automatic Polishing, Lapping, & Grinding Equipment. Preferred by thousands of Universities, Government Research Laboratories, Commercial Laboratories & Advanced Material fabrication facilities. What you will save on cost of Consumables will more than pay for SMART CUT™ LP in short period of time. 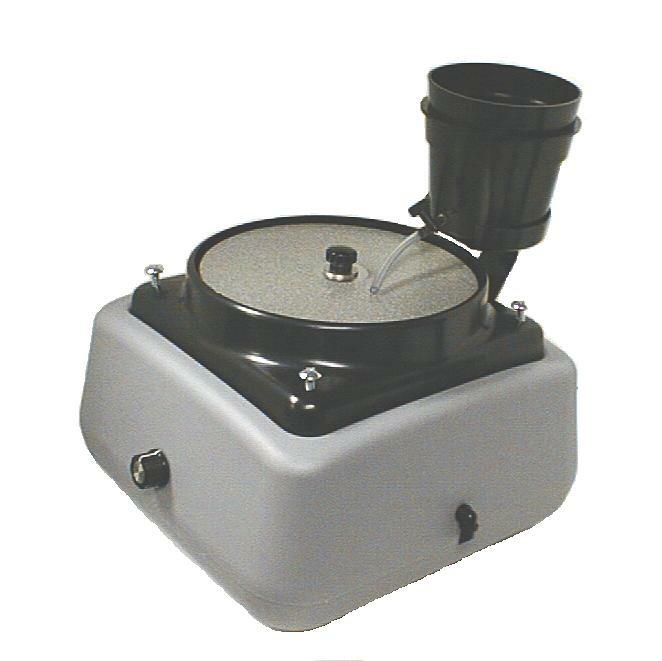 Motor: 6" & 8" Machines - 1/4 HP equivalent Ball Bearing DC with 115 VAC Converter. 6" SMART CUT™ LP - 12" x 12" x 7"
8" SMART CUT™ LP - 12" x 12" x 7"
Runs very quietly. Perfect for laboratory or production environment. Runs cleanly. No plastic aprons and cold, coolant-soaked hands are required. Specially designed coolant spray shield keeps coolant in the work area and not on you. The finishing process uses a modest supply of coolant - in most cases, a quart of coolant will last all day. Clean up is easy. Just remove the coolant spray shield and tray, wash, and you are ready to work again. Very versatile. SMART CUT™ LP has been successfully implemented in thousands of applications, from material rework, to sample preparation on just any material. Variable speed allows operator to tailor speed to material application. 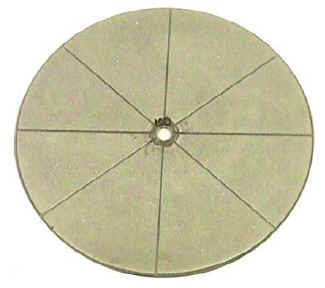 Most Popular Diamonds Discs suited for most applications are available in set (package) at significantly reduced price, than purchased separately. SMART CUT™ LP is Perfect for coarse & fine grinding and polishing of Advanced and Optical Materials. High hardness materials including metals, ceramics, refractories, cement, and petrographic thin sections. As well as full range of optical materials, such as: Bk7, Fused Silica, Zeroder, Quartz, Soda Lime Glass, Yag, Sapphire, and Many Others. UKAM Industrial Superhard Tools produces diamond grinding, polishing discs and consumables for large variety of applications, industries, lapping, grinding & polishing machines. 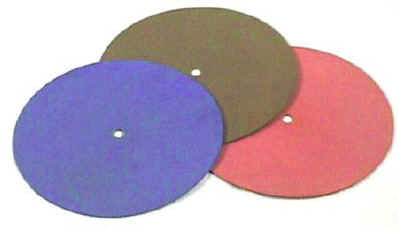 Metal & Resin Bond Diamond Discs are available from as coarse as 40 grit to fine as 1 micron. All Diamond Discs are interchangeable and come with either magnetic or adhesive backing. Other consumables such as diamond powder, cerium oxide, alumina powder, diamond compounds, diamond polishing coolant & diamond films are available upon request. Resin Bond Diamond Discs have diamonds locked into a multi level resin material. 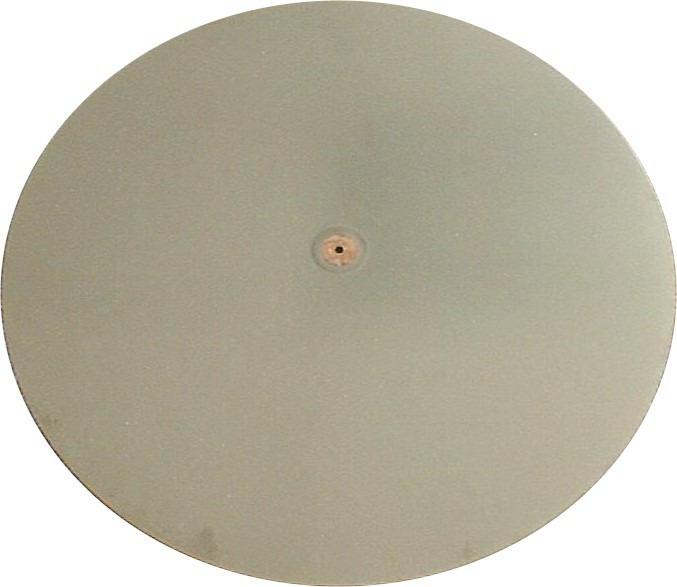 Resin Bond Discs are designed for smoothing and pre-polishing of material samples and removing chips & scratches. Perfect for improved lapping, grinding, and pre-polish finishing of materials above 60 on the Rockwell C scale. Not recommended for heavy stock material removal. Metal Bond Diamond Discs have diamond particles held firmly in place on a rigid backing by electroplated erosion resisting nickel for maximum bond strength and heat dissipation. A hard nickel alloy is used to rigidly bond a layer of sharp, blocky diamond to a steel backing. The sharp diamond particles cut cleanly with no edge rounding. 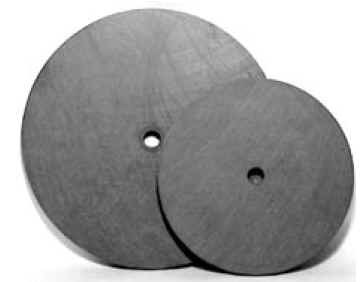 Metal Bond Diamond Grinding Discs radically reduce the time required for material lapping/grinding process. Provide backing support for metal bond and resin bond diamond discs. Diamond discs are easily attached to backing plates by their PSA backing. Backing Plates are available in either composite material or aluminum. Manufactured to exact precision; flat and parallel within TIR .001. Arbor hole is 1/2". 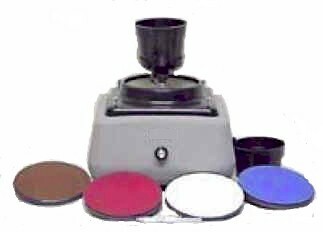 Backing Plates offer a flat and parallel grinding surface for material and sample preparation of all types of applications. A great substitute for leather and felt discs. 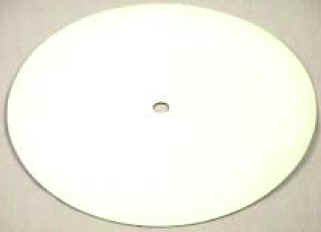 White polish discs will accept diamond compound, powder and all oxide type polishing powders. Used for final polishing. The size and size distribution of diamond / abrasive plays an important role in surface obtained by lapping, grinding, & polishing. The size of diamond / abrasive is directly proportional to material removal rate and surface roughness. Larger diamond particle sizes have a higher material removal rate. However smaller diamond particles will produce a lower surface roughness. Another factor than may affect your lapping, grinding, & polishing operation is the concentration of diamond / abrasive used. Number of diamond / abrasive grains in contact with surface of material being worked on. Change in diamond / abrasive concentration will affect distribution of load. Hence increasing the number of diamond particles, load per particle decreases due to larger number of contact points. As a essential part of finishing process, SMART CUT™ Grinding, Polishing, Lapping machines / equipment play a major role in establishing the final dimensional and surface characteristics for many industrial parts. Grinding, Polishing & Lapping operation is used for many work materials including glass, ceramic, plastic, metals and their alloys, sintered materials, stellite, ferrite, copper, cast iron, steel etc. Grinding, Polishing & Lapping is primarily considered to be a three-body abrasive mechanism due to the fact that it uses free abrasive grains that can roll or slide between the work piece surface and the lapping plate, although some grains become embedded in the lap leading to two-body abrasion. A loose abrasive machining process that combines abrasive particles within an oil or aqueous medium depending on the material being finished. Fine abrasive is applied, continuously or at specific intervals, to a work surface to form an abrasive film between the grinding, polishing, & lapping plate and the parts to be polished. Each abrasive grain used for grinding, polishing, & lapping has sharp irregular shapes and when a relative motion is induced and pressure applied, the sharp edges of the grains are forced into the work piece material. Each loose abrasive particle acts as a microscopic cutting tool that either makes an indentation or causes the material to cut away very small particles. Even though the abrasive grains are irregular in size and shape, they are used in large quantities and thus a cutting action takes place continuously over the entire surface in contact.